When growing up, I often heard that it wasn’t ideal for a family to eat dinner gathered around the television instead of having a conversation about their day. I didn’t get it. My family did that every night, and it never seemed so terrible to me. Besides, who can find anything worthwhile in their daily lives to talk about? Our program of choice was always The Simpsons. Instead of worrying about my own problems, I was laughing at those of my favorite cartoon family. I wished I could be like the rebellious Bart, though I knew I could never be an underachiever, let alone proud of it. And that’s the way it went every night of my pre-college life, except for when we’d eat too late and have to watch King of the Hill instead. Or when, in high school, my new stepmom forced us to turn off the set and focus on each other, but by that time my ability to connect on any level deeper than a joke was too far gone. Being able to distract myself and tell myself that everything is okay proved a very useful skill throughout my life, as has the ability to tune it all out and focus on an old, familiar TV show. “Simpsons Roasting on an Open Fire” is perhaps the crystallization of that perfect old TV show, the first episode, with all of its early, unsure steps and lines that sound less like real dialogue and more like catch phrases to be printed on t-shirts – which they of course in turn were. But it’s also a much more mature Simpsons than the show that we know now, about the family that flies internationally on a whim, fights murderous robots in a theme park and saves its town from becoming encased in a giant dome (a plot that Stephen King would later rip off). At the beginning, its creators wanted them to worry about money; after all, Homer works a blue-collar job and Marge is a 1950’s-model unemployed housewife. Indeed, every problem in this holi-debut is a direct result of their paucity. Mr. Burns denies Homer a Christmas bonus, so he has to get a second job as a mall Santa and is forced to skimp on gifts. Pressure from Patty and Selma remarking that it barely looks like Christmas around their house causes Homer to steal a pine tree from private property. And along the way, Flanders is there with his elaborate light display and copious gifts that become mixed with Homer’s after bumping into him, only for his son to retrieve the one Simpson present in the pile – a rubber pork chop (for Maggie – it says “for dogs”, but she can’t read). The last few years have been both some of my most rewarding and most challenging. I moved away from my home state, gained employment and financial independence from my dad, and got married to my lovely wife. All of this has been quite a period of personal growth, especially the last event – it’s difficult to want to become a better person for myself, but it’s a lot easier to do it for her. By the time I moved to the big city, I was no longer the introvert that I was in high school; college had cured me of that, as had my subsequent involvement with improv comedy – but instead of feeding my inner self until it grew and filled me out, I had built a shell behind which I could hide, a shell of not taking things seriously and treating everything like a joke. It’s not difficult for me to see roots of this in my childhood, though I’ll never blame who I became on one source entirely. And hey, it had helped me deal with some things that I wasn’t ready to face when I was younger. But with the identity of an adult life comes responsibilities, and I had the responsibility of becoming more in touch with my emotions. I can’t say that I’m fully where I’d like to be, but I’m a lot farther than I was four years ago. Now watching that particular episode, I’m not focusing on the part where Bart pulls down Homer’s Santa beard or when he coins the catch phrase, “I’m Bart Simpson, who the hell are you?” I’m paying attention to Homer trying so hard to be the provider and do right by his family. I empathize with him when he tells Marge, “I don’t deserve you as much as a guy with a fat wallet and a credit card that wont set off that horrible beeping.” And as I watch him pick out presents – the pork chop for Maggie, pantyhose for Marge (“practical and alluring”), pads of paper for Bart – I think of the many times I’ve headed to the discount rack for gifts while wishing that I could get them what they deserve, begrudgingly talking myself into reduced-price DVDs and such. But, like all good Christmas specials, this one ends on a happy, anti-commercialist note. 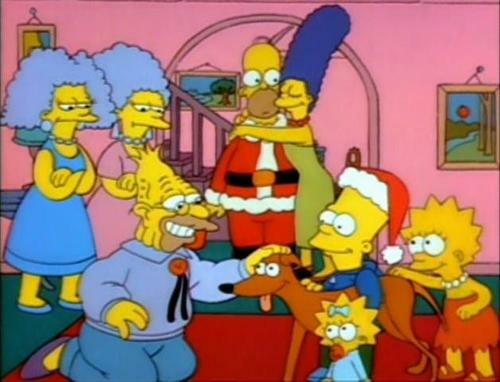 Even without any money for gifts, Homer and Bart snag a free family dog that brings the entire bunch together at the end. 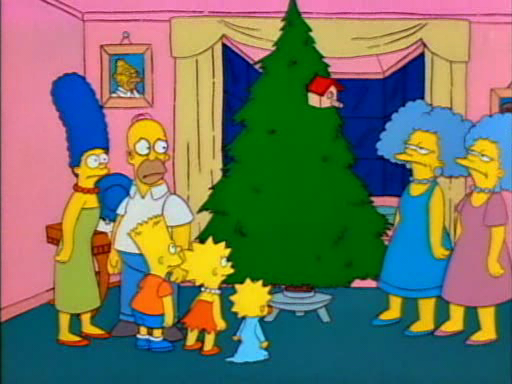 “This is the best gift of all, Homer,” Marge says. “It is?” he replies in disbelief. Sometimes I’ve been equally shocked at the support of loved ones like my wife, who appreciates what I do even when I think I’ve ruined Christmas with my inability to produce wealth. 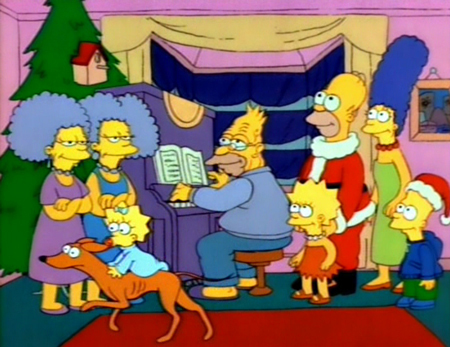 When it first premiered, I was Bart and Lisa, chiming in with the interstitial lyrics to “Rudolph” to the chagrin of my parents. Now, I’m Homer – imperfect, unwealthy, and, despite difficulties like unpleasant relatives and dollar store Christmases, carried through by the support of my loving wife, friends and family. I guess that’s what Simpsons…I mean, Christmas…is all about. Tomorrow: From a Christmas pilot to a Christmas finale, we’ll take a look at a festive conclusion to one of the greatest television shows ever made. Couldn’t have said it better myself. For all the hate this show got from parents (my mother particularly) this is consistently one of the most heart warming ‘cartoons’ ever. Futurama might hit harder, but nothing hits as consistently as The Simpsons and this was the first of many episodes that did just that. Stellar choice. I was promised an article about the pilot episode of Cop Rock. Regarding The Simpsons, we didn’t have acces to the channel upon which it was initially broadcast in the UK. ‘Do The Bartman’ was released practically in isolation, topped the charts anyway and so everything we knew of The Simpsons came from that music video that and it was years until I saw this first episode and finally had some context for the characters I thought I already knew.